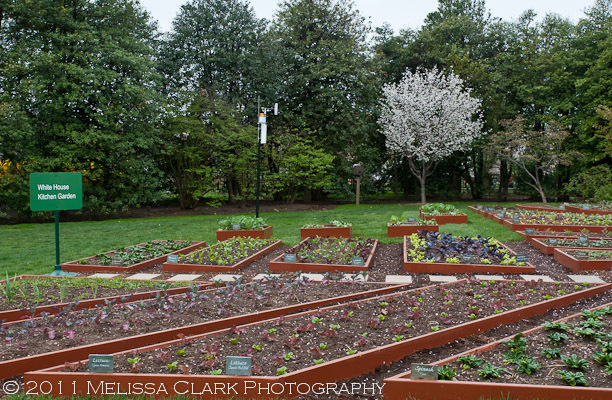 In mid-April, some friends with an extra ticket to the White House Spring Garden Tour asked if I’d like to join them. I was thrilled – I’ve never been on the White House grounds before, Congress had just come to its senses (well, at least partially) and averted a government shut-down, and I was longing for a jolt of spring. I had no idea how much we’d get to see but I chose my Nikon 24-120mm f/4 lens for the D300 and we headed downtown. 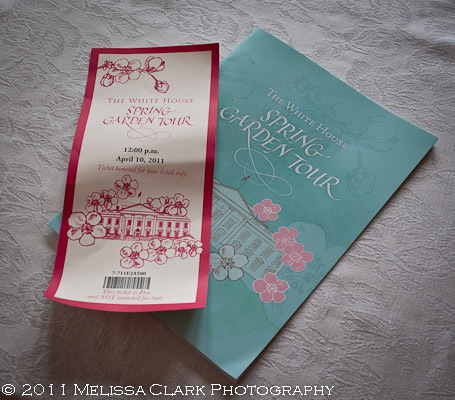 The ticket and our guide to the gardens! 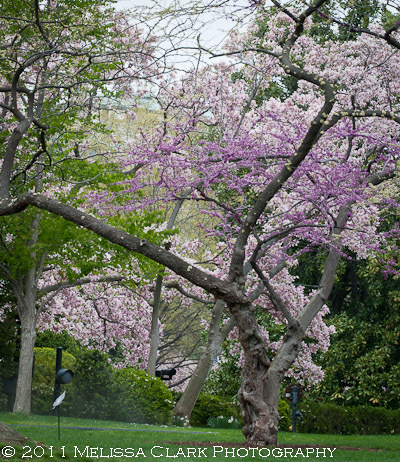 The White House Grounds (according to our brochure) are “the oldest continually maintained landscape in the United States” and are open to the public twice a year, for Spring and Fall Garden Tours. Over the years, the grounds have been “enhanced” by a series of landscape architects “to seem idealistically natural” (again the brochure). I can’t say that everything I saw quite fit with that concept (for example, on a large hill in the center of the South Lawn I saw a group of massive Camellia japonicas in bloom – beautiful, but hardly “natural” looking). Here and there, usually on the periphery of the more formal areas, however, were stands of trees in bloom or leafing out that looked more like a woodland grove if you averted your eyes from the buildings behind them. Blooming redbuds and magnolias near the Northern Red Oak planted by President Eisenhower greet visitors as they enter the South Lawn area from East Executive Park. The tour sent us through paths along the South Lawn, and up towards the South Portico, where on the porch a military band was serenading the crowds. 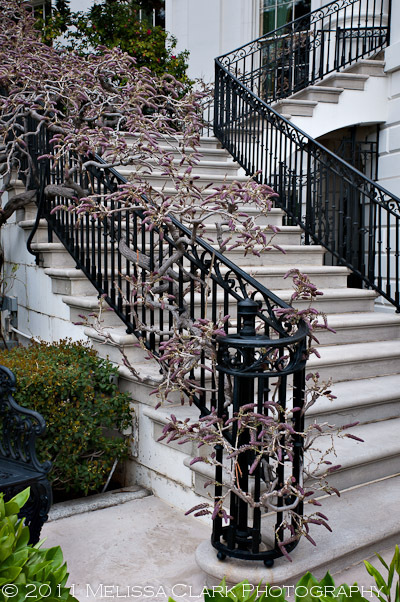 I was more entranced by the neatly clipped wisteria growing up the side of the Portico and along its beautiful ornate iron railings. Wisteria growing up the side of the South Portico porch. See the bandleader on the left side of the porch? 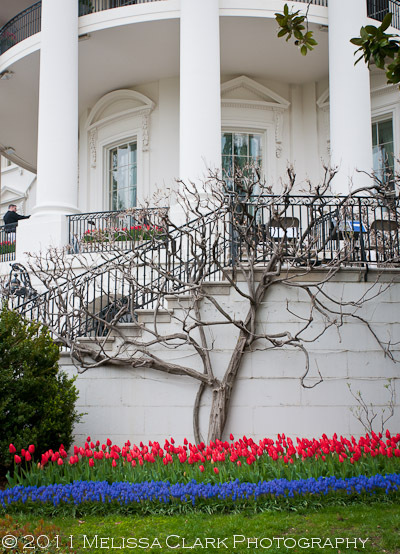 And check out the patriotic color scheme of the red tulips and blue hyacinths against the white building. Couldn't take my eyes off this wisteria. Look closely - it's about to bloom! If only this tour had been a week later - with lots of sun in the meantime. Moving away from the South Portico, we caught glimpses of the Rose Garden and the Oval Office as we headed down for a glimpse of the Kitchen Garden and the views around the central fountain that faces E Street N.W. The Kitchen Garden was neatly planted (and mulched) with lots of lettuces and herbs – cool weather crops very appropriate for the kind of temperatures we’ve been having. The Kitchen Garden, with a cherry tree (?) in bloom in the background. 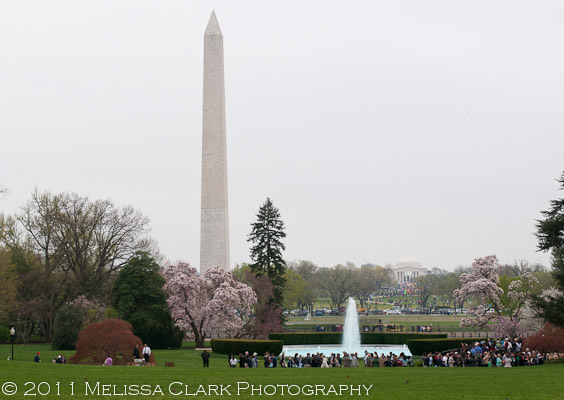 The Washington Monument and the Jefferson Memorial are visible from the hill on the South Lawn. Pity about the bald sky, but you can't have everything. The magnolias, most of which were still at peak bloom, were probably my favorite trees (along with a number of huge, magnificent dissected Japanese maples just leafing out). Here’s a favorite shot of one next to some more formal plantings near the fountain. 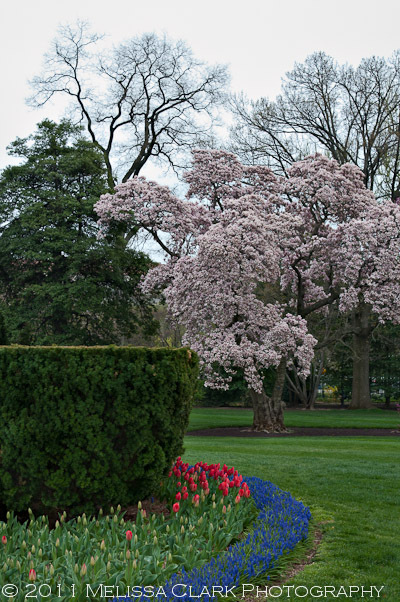 A saucer magnolia in bloom softens the clipped yew hedge and bedding bulbs surrounding it on the South Lawn.